Well, I’m afraid it’s a little overdue but here’s the first blog post. My only excuse is that I’ve been having such a great time here that it’s been difficult to find time to knuckle down and crack on with it. My first impressions of Canada are somewhat clichéd. It’s big! In fact it’s bloomin’ massive. I’m not just talking in geographical terms but in almost every other aspect, Canada seems to do things in a big way. Big pickup trucks, big fish, big trees and big guns to name but a few cornerstones of Canadian life. Algonquin Park is no exception to this rule. Measuring in at a whopping 7,635Km2, it is the third biggest provincial park in Ontario. The Park is unique in that it is the only provincial park within Ontario that logging is permitted. 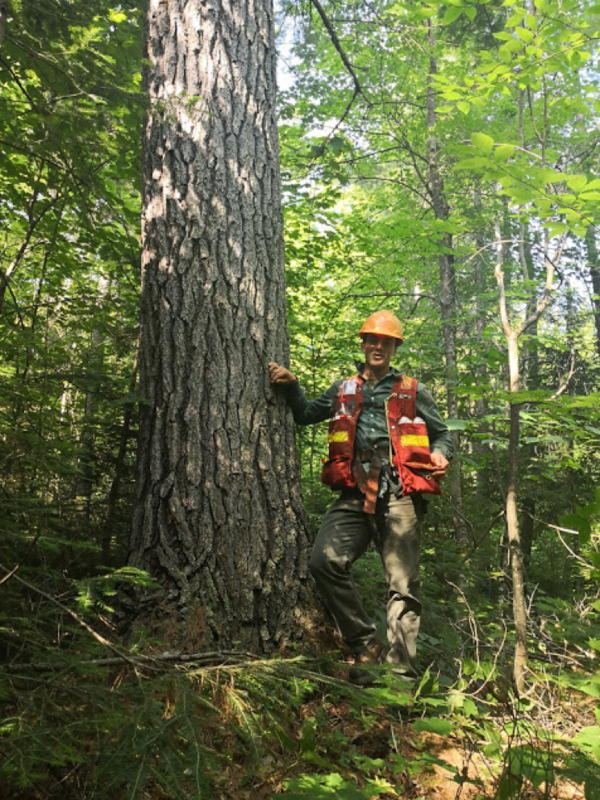 The crown agency that has been responsible for carrying out sustainable forest management within the Park since 1973 is the Algonquin Forestry Authority (AFA). Logging in the Park has played a long and significant role in its history, with the first timber licence being granted in 1830. The early logging practices in the area were a world away from those employed by the AFA today. Loggers would often select the biggest and best trees for harvest. This unsustainable approach was a significant factor in the establishment of the Park in 1893. Logging within the park still plays a hugely important role in its overall management. Today however, all forestry activities are carried out under the certification scheme for Sustainable Forest Management as part of the Canadian Standards Association. This standard is aligned with PEFC and ensures that all forest management is conducted with higher than regulatory consideration being given to the economic, social and environmental aspects of forest management. With my past forestry experience in Britain primarily being focused on the management and harvesting of production driven plantations, the AFA’s balanced approach to management in the Park has been quite revelatory to me. The Park area is divided into working circles, 55% of which is categorized as the recreation/utilization zone. Only in this area can logging activities take place. The remainder of the park is subdivided into other zones including; wilderness zones, nature reserves, historical and development zones, portages and trails. Logging is not permitted in these areas. Since arriving I have been genuinely astonished by the sensitive and balanced approach to the forest management here. 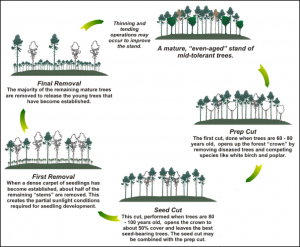 It is apparent that sustainability is at the forefront of the AFA’s approach to forest management. 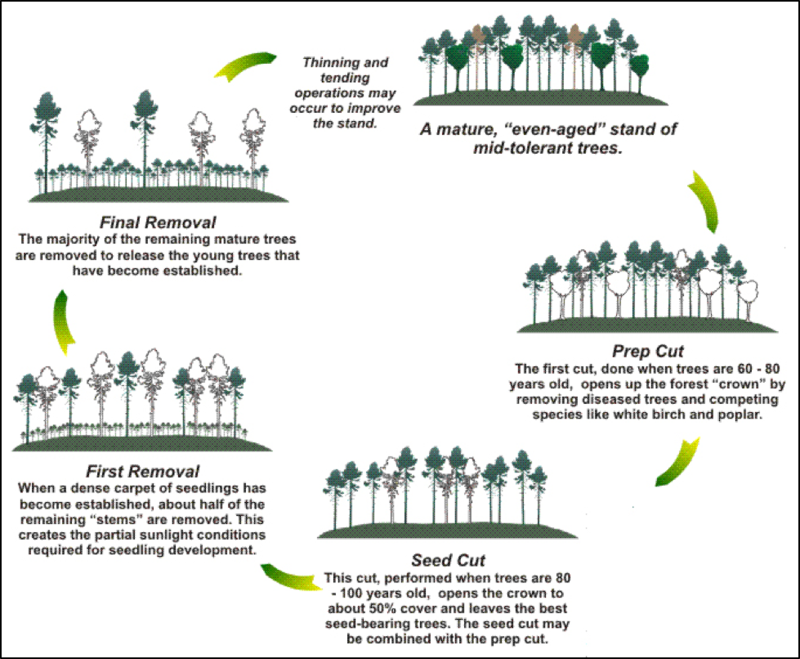 Only 1% of the total area of the Park area is harvested within a given year, 95% of which is carried out with the use of partial cutting systems. These can be broadly defined as either shelterwood or selection systems and their use is largely aligned with the two broad forest types found in the Park. The Western half of the park is largely dominated by hardwood forests, filled with more shade tolerant species. This lends itself to a selection system as illustrated in figure 1. 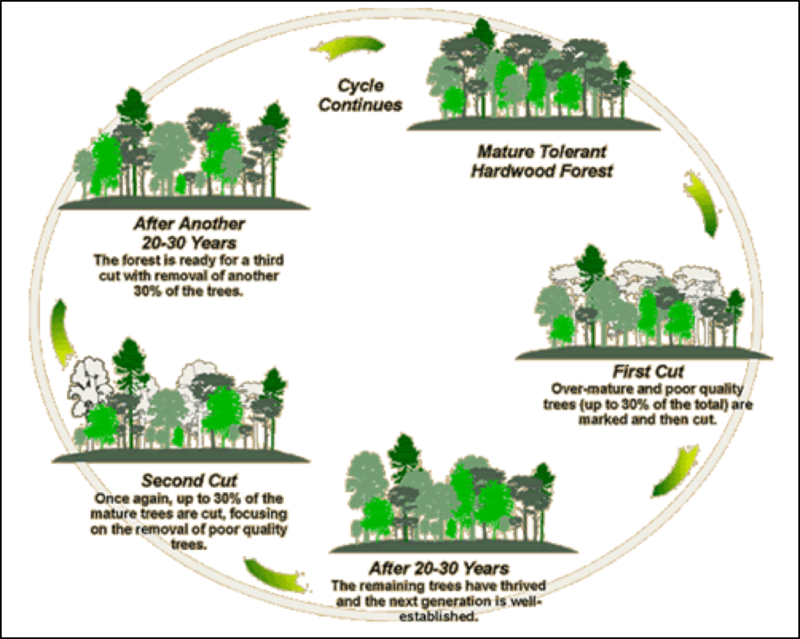 Figure 1: Illustration of selection system used in good quality hardwood stands in Algonquin. The Eastern portion of the park is home to far more shade intolerant species such as White and Red pine, this is largely due to the sandier, free draining soils found in this region of the Park. The higher light demands of these species mean that harvesting interventions must focus more on crown spacing and opening up the canopy to allow existing trees to develop further or foster new germinants. An illustration of the uniform shelterwood system is shown in figure 2. Figure 2: Illustrating an even aged shelterwood system primarily used in the Eastern region of the Park. In order to implement these systems a high level of intensive management is required. Each area that is harvested is marked by a team of tree markers according to specific silvicultural prescriptions. This entails walking through each stand and either marking each tree that is to be retained or more often than not, marking those trees that are to be removed. Despite the high cost that this incurs it is the only way to ensure that the correct trees are harvested. This has been a big part of what I’ve been doing and its proven to be challenging in lots of ways. My experience of simple Sitka spruce plantations back in the UK has not equipped me well for dealing, with the sheer complexity of species and stand types found within the Park. With over 26 commonly found species and a range of different stand types it requires an intricate understanding of both to mark correctly. In the hardwood selection stands found in the Western half of the park the approach to tree marking is largely shaped by aiming to remove the Unacceptable Growing Stock (UGS). These are usually trees of poor form, vigour, or are diseased in any way. Spacing and the proximity of the crown of trees is of far lesser importance in hardwood selection stands. Other trees that are deemed to be a good phenotype are called Acceptable Growing Stock (AGS) and are favoured for retention. Out with some of the AFA’s tree markers in a hardwood selection stand. Note the darkness and lack of light reaching the forest floor. In the Pine shelterwood systems used in the Eastern portion of the park, spacing and crown closure is of the utmost importance. Each step within the shelterwood system applies a certain intensity of removal that is primarily governed by how much room needs to be provided for the crowns of the retained trees to grow. What it’s all about! 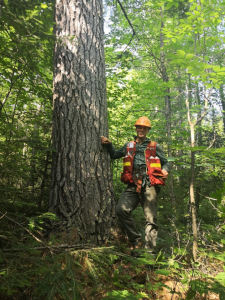 Managing for the next generation of big White pine, one of the most popular commercial species in the park. Within the shelterwood systems there can often be difficulty in successfully regenerating stands post-harvest with sufficient quantities of the desired species such as Pine and Red oak. More often than not planting will usually take place to try and help ensure that these species return. Despite this, the competition from less desirable species such Red maple and various types of Poplar is often too great. Left to its own devices, stands can be left to regenerate to a poor quality, mixed wood forest with very little to no desirable species within it. In order to prevent this from happening it is important to gather data on how stands are performing following the final cut. I spent some time with silvicultural effectiveness monitoring team doing just this. 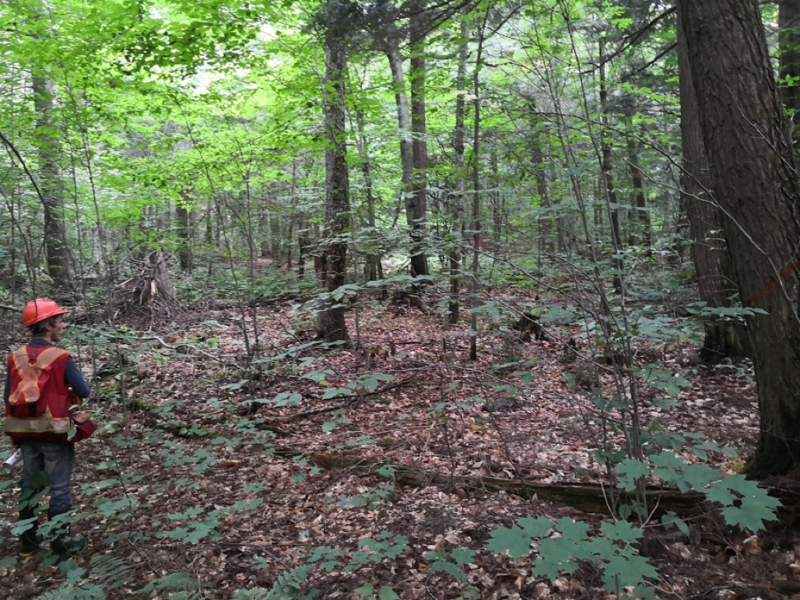 It entailed placing a number of plots throughout a stand and assessing what was growing there, what species was dominant, and whether or not the stand can be classified as ‘free to grow’ or whether some kind of silvicultural treatment is required. If the results from the SEM showed that a stand did have sufficient acceptable growing stock such as White or Red pine within it but they were being dominated by another species such as Poplar then these areas would be brushsawed. 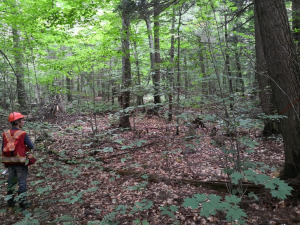 The AFA is unlike all other neighboring Sustainable Forestry licences in that it does not generally treat these areas with aerial applications of herbicide. Instead, these areas are treated manually by using a brushsaw to cut young unacceptable growing stock in a swathe around the tree. This, it is hoped will allow the AGS trees to gain more nutrients and light, promoting their growth and survival within the stand. Due to the high cost of this manual cleaning method it is crucial that the laying out of areas to be treated is done accurately so as to best maximize the efficacy of the operation. This is done by hanging ribbon along the perimeter of the area to be treated. Within the stands that I was laying out there would quite often be areas where crop trees weren’t at a sufficient density to make the operation worthwhile or, the complete opposite could happen, when some areas had crop trees that were growing superbly and didn’t have any competing vegetation. These areas would then need to be cut out of the area that was being laid out. So far my experience at Algonquin is proving to be massively rewarding, challenging and enjoyable. The time seems to be passing a little too quickly for my liking. I’m really looking forward to seeing some other aspects of what the AFA does including the harvesting operations over the next couple of months.